Natural (we have used color and flavor ingredients that are derived from natural sources) colors & flavors with fruit juice. Vitamin C & fat free. With other natural flavors. A quiescently frozen confection. Contains 10% fruit juice. 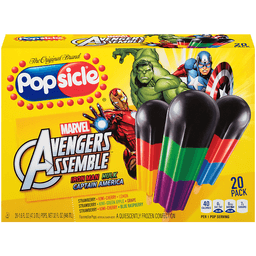 Popsicle Pops are totally cool and just for you. So many colors, flavors, shapes and sizes - which are your favorites? Love em all! If it's Popsicle, it's possible! Guarantee. The original brand. 40 calories per pop. 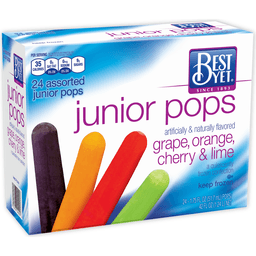 80 calories per 2 pop serving. No sugar added. Reduced calorie chocolate flavored frozen dessert. 33% fewer calories than our regular Fudgsicle. 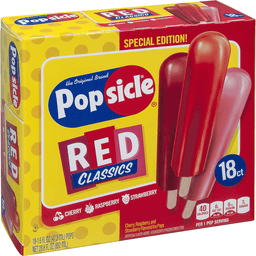 The original brand Popsicle. The original brand Yosicle. If it's sicle. It's fun! Popsicle, Fudgsicle, Creamsicle, & Yosicle are all part of the Sicle brand family. 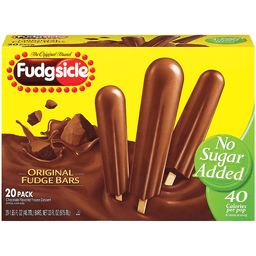 The original brand Fudgsicle. The original brand Creamsicle. Calories reduced from 120 to 80 per 2 pops. Toll Free: 1-800-931-2849. Inner units not for retail sale. www.popsicle.com. Recyclable. Guarantee: If you are not satisfied with the quality of this product or have any questions or comments, please send your name, address, and reason for dissatisfaction along with this entire side panel to the address below, or visit us at www.popsicle.com, or call 800-931-2849. A prompt adjustment of equal value will be made. Orange. Cherry. Grape. 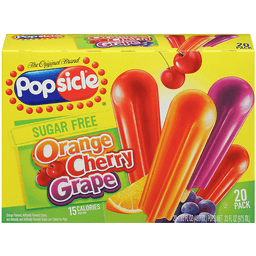 Orange flavored, artificially flavored cherry, and naturally and artificially flavored grape low calorie ice pops. 15 calories per pop. The original brand. 20 pack. If it's Sicle it's fun! Gotta get one! Popsicle, Fudgsicle, Creamsicle, & Yosicle are all part of the Sicle brand family. Toll Free: 1-800-931-2849. www.popsicle.com. Recyclable. Guarantee: If you are not satisfied with the quality of this product or have any questions or comments, please send your name, address, and reason for dissatisfaction along with this entire side panel to the address below, or visit us at www.popsicle.com, or call 800-931-2849. A prompt adjustment of equal value will be made. Unilever, Englewood Cliffs, NJ 07632. Visit us at www.popsicle.com. 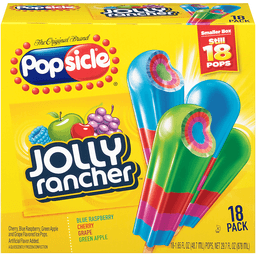 Popsicle® Jolly Rancher Ice Pops. The original brand. 4 Layers of untamed fruit flavor! Artificially flavored cherry, green apple, grape and blue raspberry ice pops. Quiescently frozen confections. 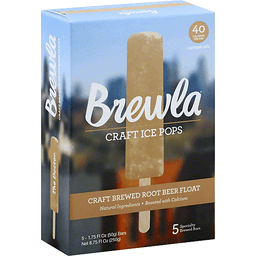 Per 1 pop serving: 40 Calories. 0g Sat fat, 0% DV. 0mg Sodium, 0% DV. 7g Sugars. 18 - 1.65 fl oz (48 ml) Pops. Net 29.7 fl oz (864 ml). Pop Story: In 1905, 11 year old Frank Epperson left a mixture of powdered soda and water, along with a stirring stick outside. Whooops! He awoke the next morning to find a frozen pop. Whoa! Popsicle® was born and became America's favorite ice pop! Accident Miracle Popsicle®! Popsicle®, Fudgsicle® & Creamsicle® are all part of the Sicle® brand family. 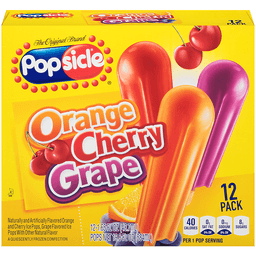 Popsicle® Orange Cherry Grape. 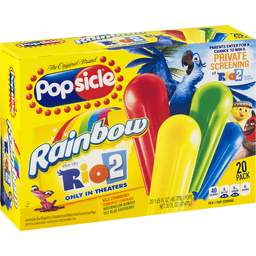 Popsicle® Rainbow. 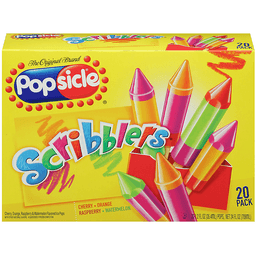 Popsicle® Scribblers. Find all our flavors at Popsicle's website. Recyclable. Popsicle® is a registered trademark. The Jolly Rancher and Untamed Fruit Flavor trademarks and trade dress are used under license. All rights reserved. 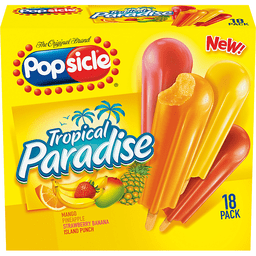 Questions or Comments Call: 1-800-931-2849 or Visit us online at www.popsicle.com. © Unilever. Strawberry, lemonade, watermelon & blue raspberry flavored ice pops. Wild strawberry; Sunburst lemonade; Watermelon wonder; Sky blue raspberry. The original brand. Artificial flavor added. A quiescently frozen confection. If it's Sicle it's fun! Gotta get one! www.popsicle.com. Recyclable. Guarantee: If you are not satisfied with the quality of this product or have any questions or comments, please send your name, address, and reason for dissatisfaction along with this entire side panel to the address below, or visit us at www.popsicle.com, or call 800-931-2849. A prompt adjustment of equal value will be made. UPC: 77567-02153. Cherry, orange, raspberry & watermelon flavored ice pops. With other natural flavors. A quiescently frozen confection. Cherry. Orange. Raspberry. Watermelon. Per 2 Pop Serving: 60 calories; 0 g sat fat (0% DV); 0 mg sodium (0% DV); 11 g sugars. The original brand. Toll Free: 1-800-931-2849. www.popsicle.com. Recyclable. Question or comments? Call: 800-931-2849 or visit us online at popsicle.com. Iron man. Hulk. Captain America. 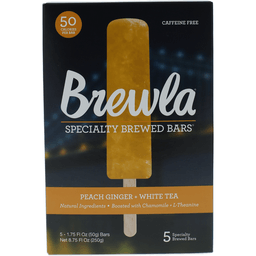 Naturally and artificially flavored ice pops, quiescently frozen confections. Strawberry-Kiwi: cherry; lemon. Strawberry-Kiwi: green apple; grape. Strawberry-Kiwi: cherry; blue raspberry. The original brand. Per 1 Bar: 40 calories; 0 g sat fat (0% DV); 0 mg sodium (0% DV); 7 g sugars. Inner units not labeled for individual retail sale. Recyclable. Questions or comments? Call: 800-931-2849 or visit us online at popsicle.com. Per 3 fl oz Sqeezeup: 160 calories; 0 g trans fat; 40 mg sodium; 12 g sugars. Delicious enlightenment. Non GMO Project verified. nongmoproject.org. 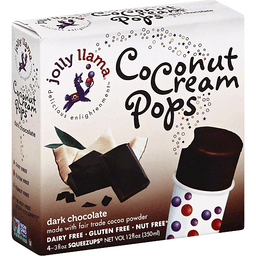 Embrace nature and enlighten your palate with our Jolly Llama Coconut Cream Pops made with creamy coconut and FairTrade Cocoa! Trust the power of the Jolly Llama to delight you and your family with only nature's most wholesome offerings. Made with only the highest grade ingredients from around the world, our Coconut Cream Pops are delicious and healthy. Indulge your taste buds in rich chocolaty goodness. Delight in a dairy-free frozen treat with an unbelievably luscious texture. Have a Coconut Cream Pop and discover how truly delicious enlightenment can be! Delight in all that Jolly Llama provides! Sorbet pops. Dairy-free cream pops. Join our family! Fun contests, great prizes, product announcements and more! Facebook: facebook.com/TheJollyLlama. Instagram: (at)thejollyllamaco. Twitter: (at)TheJollyLlama. YouTube: thejollyllama.com/videos. Questions or Concerns: thejollyllama.com. Made in the USA. 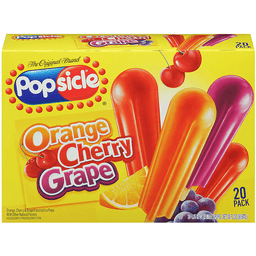 Orange, cherry & grape flavored ice pops with other natural flavors. The original brand. A quiescently frozen confection. If it's Sicle it's fun! Toll Free: 1-800-931-2849. www.popsicle.com. Recyclable. Guarantee: If you are not satisfied with this product or have any questions or comments, please send your name, address, and reason for dissatisfaction along with this entire side panel to the address below, or visit us at www.popsicle.com or call 800-931-2849. A prompt adjustment of equal value will be made. Special Edition! Red cherry, red strawberry and red raspberry ice pops. Cherry; Raspberry; Strawberry. The original brand. Artificially flavored. A quiescently frozen confection. Per 1 Pop Serving: 40 calories; 0 g sat fat (0% DV); 0 mg sodium (0% DV); 7 g sugars. Questions or comments? 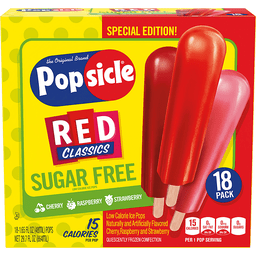 Call: 1-800-931-2849 or visit us online at www.popsicle.com. Recyclable. Frozen dairy dessert cones. Chocolate. White chocolate with fudge. Chocolate with fudge. New! No artificial flavors or colors. Added colors from natural sources. Chocolate: 300 calories per cone. White Chocolate Fudge: 300 calories per cone. Chocolate Fudge: 310 calories per cone. See nutrition information for total fat and saturated fat content. The original sundae cone. Crispy sugar cone. Delicious creamy chocolate and fudge center. Rich chocolatey lining. Chocolatey nugget. Dipped in chocolatey cookie coating. 100% recycled paperboard. Minimum 35% post consumer content. Please recycle this carton. Partially produced with genetic engineering. Inner units not labeled for retail sale. At the 1904 World's Fair, an ice cream maker ran out of bowls. He asked a nearby waffle vendor to roll waffles into cones, turning it into a finger food. In 1928 the Parker brothers (Bruce and twins I.C. and J.T. Stubby) took this great invention even further by adding chocolate coating topped with nuts. One of the brothers' wives said it looked like a fried chicken leg, thus the Drumstick novelty was born! 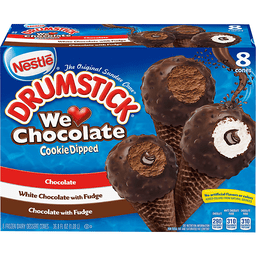 Today Nestle Drumstick is America's No. 1 sundae cone. Nutritional Compass: Nestle - Good food, good life. Thoughtful Portion: 1 cone. These delicious treats are perfect for sharing with family, friends and a fun activity. Good to Talk: Questions or comments? drumstick.com. Text or call us at 1-800-441-2525 anytime! Facebook. Twitter. Artificially flavored vanilla light (The portion of light ice cream in this product has 60% less fat and 30% fewer calories than a similar portion of a range of full-fat ice cream. 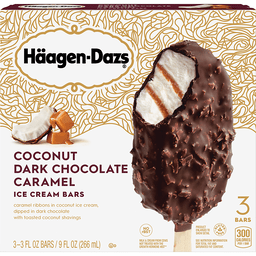 See nutrition for fat and saturated fat content) ice cream bar with chocolatey coating. Not a light food. Per 2 Bars: 240 calories; 13 g sat fat (65% DV); 60 mg sodium (3% DV); 19 g sugars. Great taste since 1920. Questions or Comments: 800-931-2854. 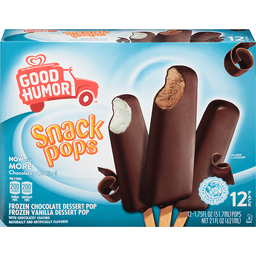 Visit us at www.goodhumor.com. The portion of light ice cream in this bar has 90 calories, 2.5 g fat. A similar portion of a range of full-fat ice cream has an average of 130 calories, 8 g fat. This bar is not a light food. Like us at facebook.com/goodhumor. Recyclable. With love from our truck to your freezer. Craft Brewed Root Beer Float. 40 calories per bar. Caffeine free. Natural ingredients. Boosted with calcium. 5 specialty brewed bars. The Doctor: A trip to the doctor isn't normally a cause for celebration - that is, unless your doctor is a natural blend of creamy root beer boosted with calcium. A taste so refreshingly good, you might just want to take two (and call us in the morning). Craft brewed root beer. Only 40 calories. Calcium to support healthy bone strength. Lick well, live well. Stick with us! facebook.com/brewlabars. Twitter (at)brewlabars. Made with love, Dan + Rebecca, Rebecca + Dan, siblings + founders. Good source of calcium. Gluten free + caffeine free. Non GMO. With Fairtrade cocoa. Per 3 fl oz Serving: 140 calories; 0 g trans fat; 40 mg sodium; 9 g sugars. Delicious enlightenment. Gluten free. Non-GMO. Dairy free. Non GMO Project verified. nongmoproject.org. Squeezups. 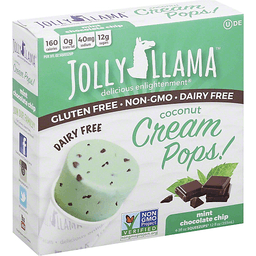 Embrace nature and enlighten your palate with our Jolly Llama Coconut Cream Pops made with creamy coconut and FairTrade Cocoa! Trust the power of the Jolly Llama to delight you and your family with only nature's most wholesome offerings. Made with only the highest grade ingredients from around the world, our Coconut Cream Pops are delicious and healthy. Indulge your taste buds in rich chocolaty goodness. Delight in a dairy-free frozen treat with an unbelievably luscious texture. Have a Coconut Cream Pop and discover how truly delicious enlightenment can be! Delight in all that Jolly Llama provides! Sorbet pops. Dairy-free cream pops. Join our family! Fun contests, great prizes, product announcements and more! Facebook: facebook.com/TheJollyLlama. Instagram: (at)thejollyllamaco. Twitter: (at)TheJollyLlama. YouTube: thejollyllama.com/videos. Questions or Concerns: thejollyllama.com. Made in the USA. Natural ingredients. Boosted with chamomile + L-theanine. 50 calories per bar. Caffeine free. Lick well, live well. The Lullaby: peach ginger + white tea. How do you find the time to unwind without getting a new email, message, text, reply, poke, buzz, bing, or bork? We were wondering the same thing, so we created The Lullaby - a relaxing blend of juicy peaches, delicate white tea, and a bite of ginger, boosted with chamomile and l-theanine. Enjoy it on-the-go or off-the-grid - nohashtagnecessary. Craft brewed white tea. Only 50 calories. Chamomile + L-theanine for a calming effect. Lick well, live well. Stick with us! facebook.com/brewlabars. Twitter at brewlabars. Made with love, Rebecca + Dan, Siblings + Founders. Gluten free + caffeine free. Chamomile extract. L-theanine. Non GMO.